I grew up in the neighborhood next door to Fishtown, and frankly, it has come leaps and bounds from where it was when I was a kid. Let’s just say teeth were optional back then. 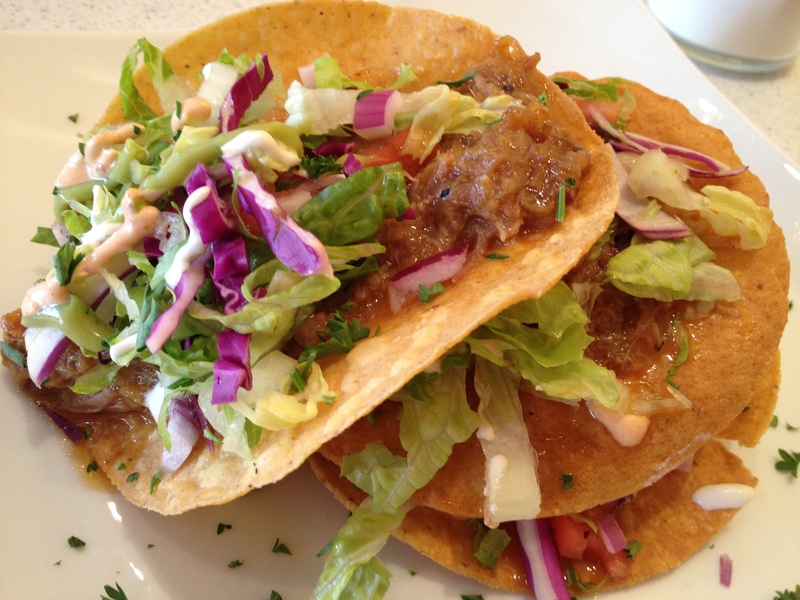 Anywho, there are so many new places to eat, it’s hard to even keep track of what’s opening. So when I heard there was a new diner opening, I had to check it out, because, man, I love diner food. I Assure You, We Are Open! Mugshots opened, a bit behind schedule, in the 2424 building on York street. It’s actually not a free standing diner, it is on the first floor of the building, with office and artist spaces above it. Hot Mess Hess went with me to get some dinner before we hit a local comedy show at Urban Saloon in Fairmount. And yes, we were HUNGRY. Walking into the diner, I was struck by how clean, happy and bright the place was. Yes, they did just build it, but I am used to diners where the years of grime are part of the character. Plus, do you really hear the words “new diner” often? Nope. The motif of this place is, yes, mugshots. So the walls are littered with celebrity mugshots. I sat under Bill Gates. 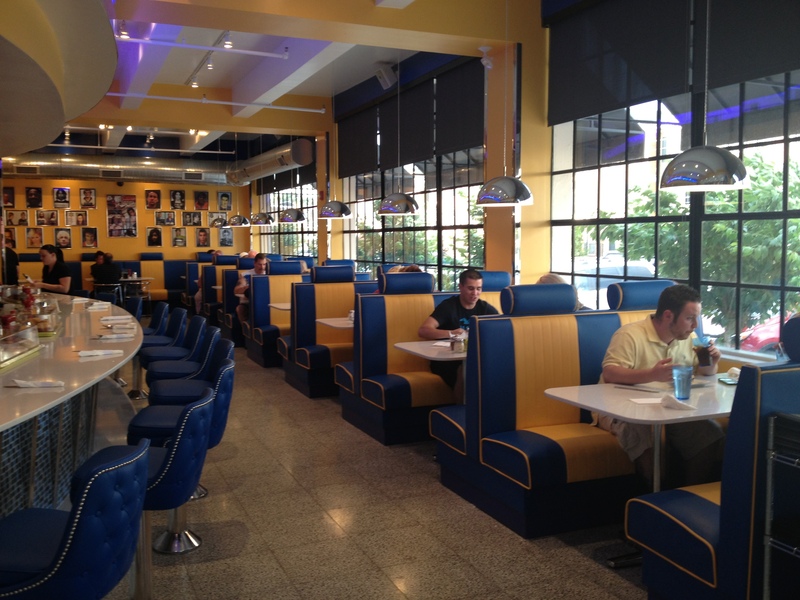 The booths are cool vinyl blue and yellow and really are reminiscient of 50’s diners without being too in your face Happy Days retro. for plates. 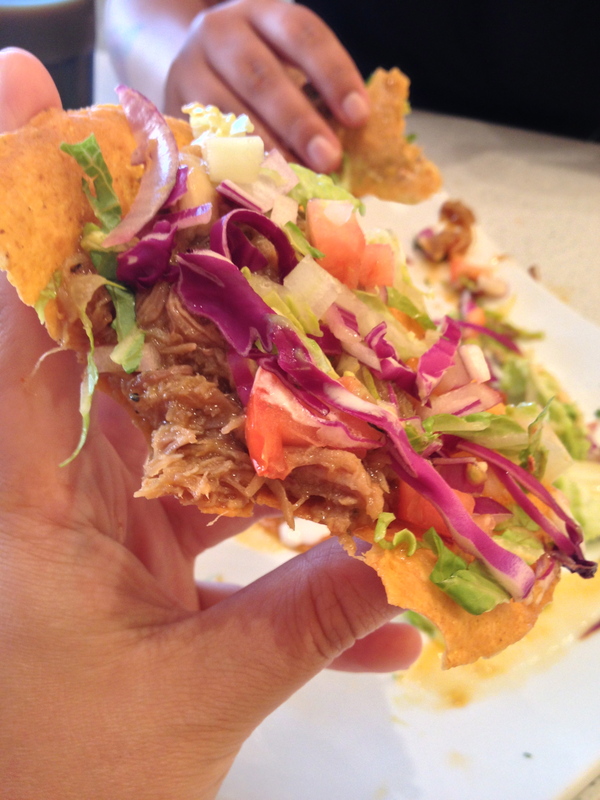 All the ingredients were fresh, bright and delicious. There might have been some hand stabbing for the last few bites. It was nice to see a place understand that you can fry your own tortillas and not just grab them out of a bag. I should mention here how nice the wait staff was. The plate thing aside, our waitress was really on the ball, and everyone who worked there was pleasant, but not in a stepford wives sort of way. Any questions I had about the menu were answered promptly, and when I asked about food she had not eaten, I was given a great answer of “I haven’t had it but *soandso* (pointing) did and they like it”, which I like better then I lie or a shrug with an “I don’t know”. 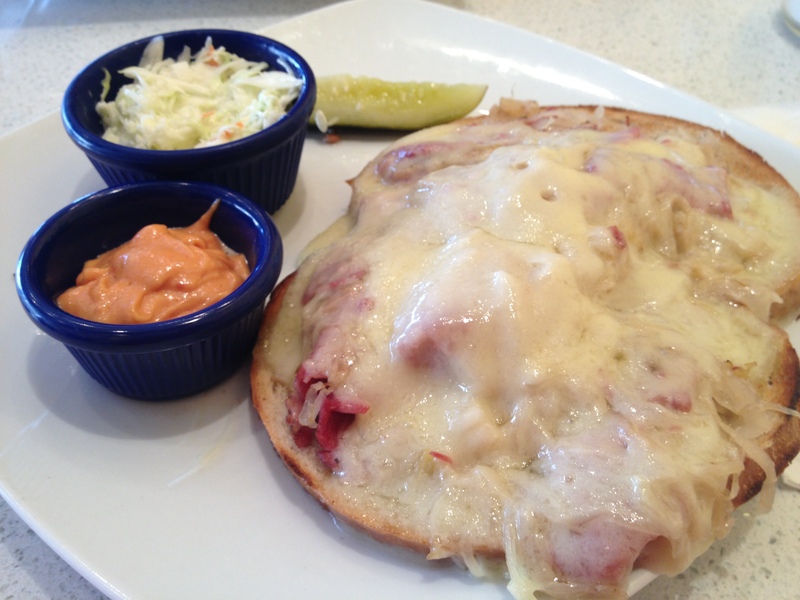 For our dinners, I got the Reuben Sandwich. The rye bread was nice and warmed from the melted cheese and there was a nice amount of delicious, medium cut corned beef (too thin and it disappears and too thick and you are chewing for 3 days). The cheese was, as cheese always is, delicious (it knows it’s role) and plentiful (sometimes when you order a Reuben, they skimp on the cheese). The kraut was basically out of the bag, but it worked with the sandwich. What I found peculiar was that the russian dressing was on the side. Normally on a Reuben, it’s on the bread, under the kraut. I just used all that was there and covered the whole thing before I dug in. Yes, it looked odd to me, but was still great. Hot Mess Jess got herself her standard grilled chicken sandwich with mayo. 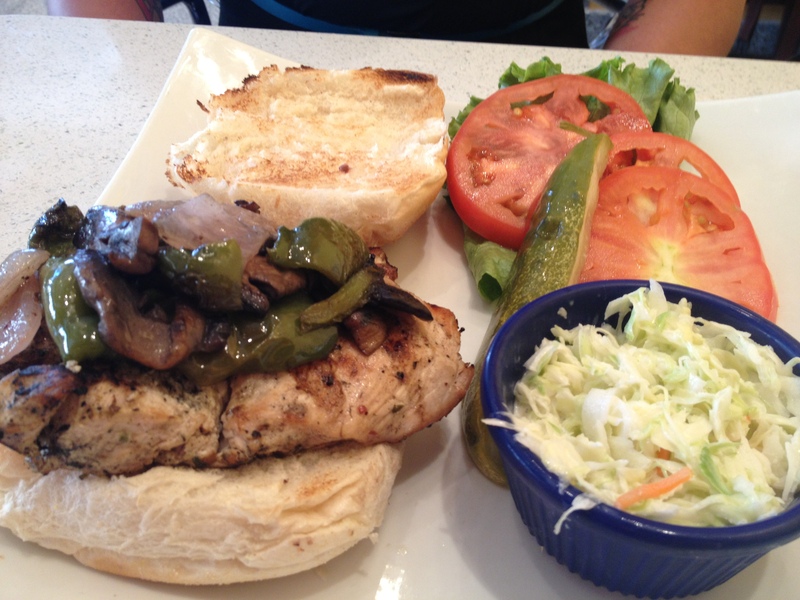 A grilled chicken sandwich is a grilled chicken sandwich, there’s not too much you can do to pretty it up. It’s a (not so) secret in the food biz to buy meats with grill marks that are frozen and then just warm them up either in the microwave or quickly on the flat top. That chicken seemed to me to actually have been grilled. It was also (yeah I had a bite) juicy and a thick piece of chicken. Even the roll was a bit toasty. Finally, I go out to eat with Hot Mess quite a bit, and we always ask for extra mayo (we ordered fries too, which I didn’t take a picture of because, well, fries are fries. They were hot, they were cooked perfectly, they were delicious) for fries. Sometimes that means a small shotglass of mayo. Sometimes that means they wheel out the 5 gallon jug of Admiration mayo (my fave but still a bit much). Our waitress brought us out a big dish for each of us. Gold stars for her!! 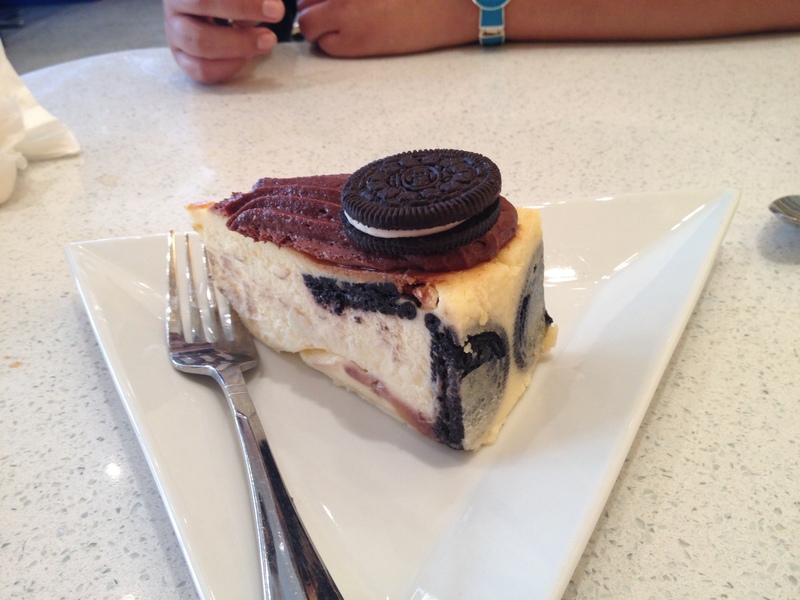 Finally, because we are gluttons, we had a piece of Oreo cheesecake. It was everything it says it is: cheesecake with Oreos in it. It was smooth, creamy and hit the spot. Not to say it was easy to pick a dessert, apparently they make all thier desserts in house and they have a truckful! 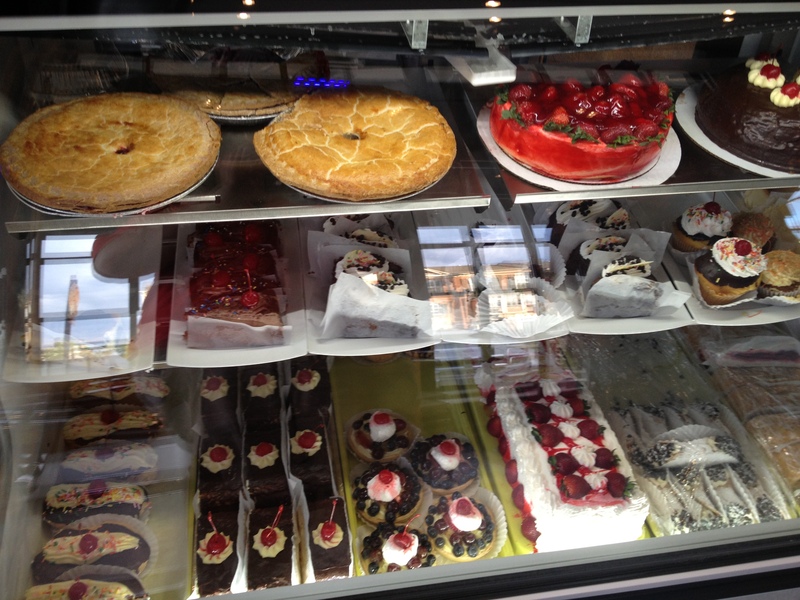 Pies, cakes, cookies, all sorts of stuff. On our way out, we walked past, who I believe is the owner, who was visiting with all the tables asking if everything was alright, if they enjoyed thier food and stuff. When he asked us if things were ok, we told him yes, and then I asked him why the dressing for the reuben was on the side, that I found that odd even tho I still enjoyed it. He told me that they were finding that some people liked the dressing on there, and some people did not like the dressing at all, so they decided to just put it on the side. It was nice to see a place listen to thier customers, like the gang over at PYT. Finally, our bill was about 35 bucks, which is acceptable for 2 people, in my opinion. 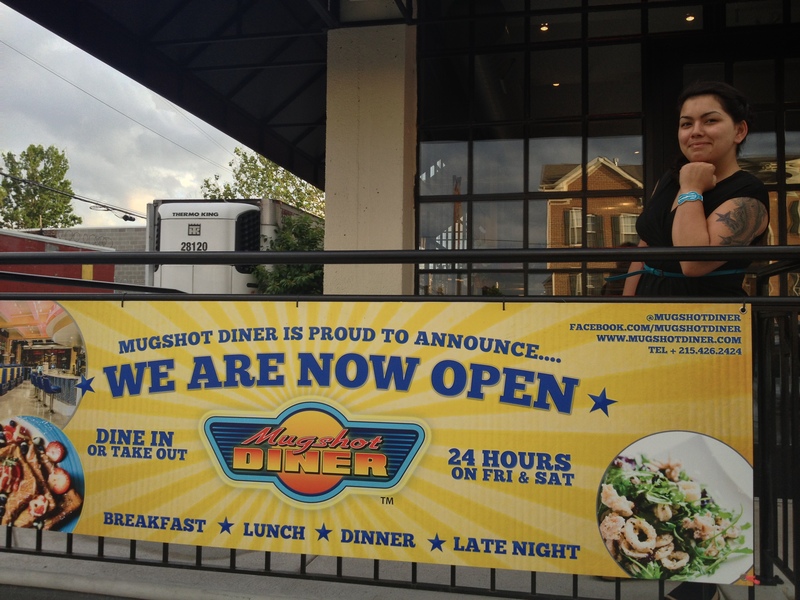 So, if you find yourself in Fishtown, check out Mugshots. The food is good, not too expensive, there is ok parking around the building and the owner is on top of stuff. Good stuff. Here is thier new commercial, check it out!